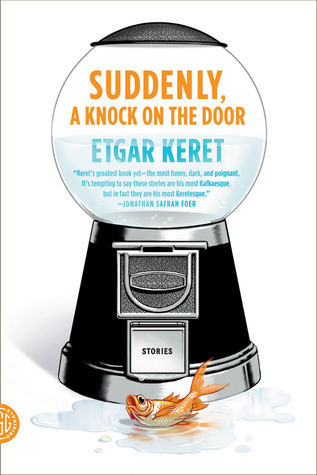 Reading Etgar Keret’s Suddenly, a Knock on the Door was a truly surreal experience. The majority of these stories seemed to be constructed effortlessly by the reader showing how crazy and in tune to his differences he truly is. As a reader you get the feeling as if he has been contemplating these complex subjects or quirky situations since childhood and has been waiting for the right time to unleash them to the world. I know many of us have contemplated some of the ideas he presents, but ultimately never thought much of it, or failed to make it sound so plausible. The author’s ingenuity enables the reader to investigate the absurd nature of his stories which makes it all the more interesting and compelling. Through it all, whether it has come from family, friends or past experiences the author has maintained a childlike exuberance with respect to channeling his vivid imagination and committing his varying takes on life to memory. At times some of these stories resembled an M.C Escher painting with thoughts of talking, fortune bearing goldfish, a dead wife being reincarnated as a traveling poodle, a person’s ability to unzip the outer shell and reveal a new “you”, or a person’s last dying wish for peace on earth transforms him into a low hanging fruit destined to be a part of a center”piece” in somebody’s kitchen. Imagery, symbolism, metaphors, allegories, this book has it all and then some. Growing up I was never into fantasy or surrealism, I lived in a sheltered world of truths and consequences with little use for an imagination unless it was trying my best to be like Michael Jordan on the basketball court or if I had to conjure something up for school. The author here knows how to delve, manufacture, and question. And from what I can gather it seems like he enjoys digging deep into the recesses to provide his audience with some entertaining stories. Or maybe he’s channeling his inner Hemingway and taking his sage advice of “write drunk;edit sober.” Either way it was very appreciated. It all starts with the titular story and like a gun to the head the readers are transported into the mind of the author and for the next hundred or so pages you wonder what is coming next. From portals, to various dreamscapes, to provocation leading to the revealing of a true self; a metamorphosis if you will, the author’s subject matter contains no bounds. There are also some very dark stories that in one case have a child being exploited as a pawn in his parent’s messy divorce, a contract killer on death row talking of his past exploits and his willingness to go the extra mile that his hero never traversed. Anticipating the gates of hell he gets a rude awakening in his own personal after life revelation. Most if not all of the stories utilize the human condition with all of its tragedies and natural regressions to tell a story in a David Lynch kind of way that resonates to the majority. As the stories are unveiled, you realize the drastic conflict between dreams and the restricted reality in which we live. For Mr.Keret this restraint is illogical for him and as you read he will show you what it means to embrace the whimsy and quirkiness from within. One of my favourite stories involved a bizarre friendship between a young man and woman with an emotional attachment, but a wanting for a true love not realized on one end leads to desperation and a tragic ending. My favourite stories ranged from the absurd, to the funny, to the tragic, to the dark. I didn’t enjoy them all, in fact I found some to be quite pointless, but I will say that the creativity is apparent and his ability to provoke added thoughts is ever-present. I anticipate reading more of this man’s work in the future.